I am embarrassed to say how long it has been since I have published a post that discusses books. I think my blog is evolving into something other than a book blog – but that is a subject for another day. Today I thought I would share the eclectic assortment of reading material that I have gathered this week. It should be a fun weekend! 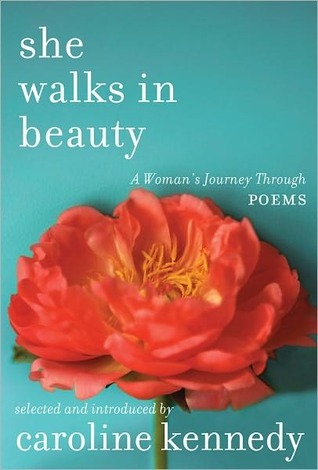 She Walks in Beauty: A Woman’s Journey through Poems by Caroline Kennedy. This was purely an impulse buy – I had a coupon that I desperately wanted to use but refused to buy another fiction book without reading some of the many I already own. This book caught my eye, however, because lately I have this desire to learn to appreciate poetry. Part of the reason is because I think as an English teacher I should have a comfort level with this mode of writing, but the other reason is because I feel that poetry will force me to slow down and notice the details of life that I have raced passed all these years. I like this anthology because it was written by a middle aged woman for middle aged women. There MUST be some poems in here that I can relate to! I plan to spend a few minutes each day reading through a poem or two and savoring the images and messages that are conveyed within. 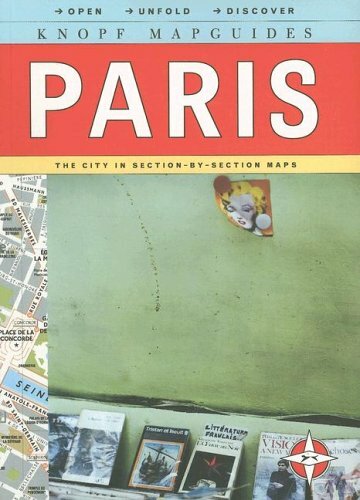 Knopf Mapguides: Paris While I am not certain that my trip to Paris will take place this summer, I am still having fun planning it. I found this little gem at the “going out of business” sale at our local Borders *heavy sigh* and knew I had to have it. I love the size – it would fit in any size purse or backpack, including the Vera Bradley mini-hipster that I plan to carry at all times. The 19 Arrondissements are divided into 10 pull out maps – so that I can actually read the street names without having to use a high-powered magnifying glass. Each section includes a list of the top attractions – as well as a few local restaurants and cafes. I have even added a few attractions of my own on the corresponding maps which I found in Literary Cafes of Paris (Noel Fitch) and Markets of Paris (Dixon and Ruthanne Long). At this same book sale I found A Homemade Life by Molly Wizenberg. JoAnn and Margot both reviewed this book a while back and I knew at the time that it was one I would enjoy. While my family would doubt that I truly have a love of cooking – given my lack of time in the kitchen these past few months (years? ), I do harbor dreams of someday returning to gourmet creativity. The reason I decided to purchase this book now, however, is because I want to learn how to write about food before going on my Parisian holiday. I would like to know how to incorporate all the senses when describing the most simple meal of bread and cheese – in a way that would compliment my photos and create a fulfilling experience for anyone who cares to read of my adventures. Finally I am slowly reading, digesting, and completing the exercises found in Inner Excavation by Liz Lamoreux. I found this book over the holidays while browsing the mixed media art shelves. I like that the author focuses on three aspects of the creative life in order to try to discover the person that lies within. She first focuses on photography and the idea of slowing down long enough to live in the present. She is teaching me to see beauty in every day life and to learn to be purposeful in my photography throughout the year, not just on special occasions. Then she encourages the reader to experiment with poetry – which can come from reading, journaling, or just allowing the mind to roam free. Finally she asks us to combine these two endeavors into a mixed media collage that offers ultimate freedom of expression through color, texture, words, images, …. well, you get the idea. To celebrate this new inner journey I decided to treat myself to a new journal and matching pen: something in which I would normally never allow myself to indulge. In fact, after I bought these they sat on my table for weeks: I didn’t want to write in it for fear of messing up something so beautiful. But as a statement of my new quest of adventure, I decided to just start writing – in pen of all things (I always write in pencil so that I can erase my mistakes). I have decided that it is time to start embracing my imperfections. I chose this particular pattern for two reasons. The name of the pattern is Watercolor and it reminds me of the en plein air style of Monet. So, in honor of my upcoming trip to study the Impressionists, I thought that this would be a fitting companion. 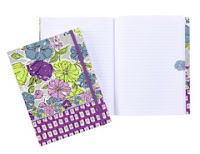 In addition, the predominant colors of this journal are lime green (my favorite) – violet and gray. Since becoming a grandmother I have decided to claim the poem When I Grow Old, I Shall Wear Purple as my own (although I can vow that you will never see me in a red hat!!). I try to wear purple most days of the week (my wardrobe is a bit sparse of this color now – but I will slowly add pieces as time progresses) and I am also trying to “live” now rather than wait until “someday” And finally, I think it is significant that the background color is gray – and not white. White is stark and sometimes cold – whereas gray is softer, as though the wisdom that comes with age has mellowed its temperament. I would like to think that is what my gray hairs symbolize.. So funny – I just purchased She Walks In Beauty yesterday morning! Caroline Kennedy talked about the book on NPR earlier in the week and I had to have it. Hope you enjoy A Homemade Life. 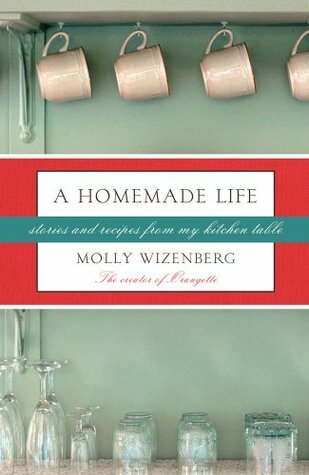 The stories of her 'life in food' are wonderful, even if you don't have time to try many of the recipes. I hope you get to go to Paris this summer. I shall keep my fingers crossed. I'm excited about A Homemade Life – the cover of that book is calling my name. I like the mix of reading and I do hope you get to Paris. I adored "A Homemade Life" and I think you'll love it too!!! Wonderful selection, Molly. She Walks in Beauty has been on my list since I saw it was out. I love poetry, but find I don't spend much time reading it. I really feel poetry is best read aloud, which one doesn't necessarily want to do sitting alone in a coffee shop! Molly, your post/letter to your mom was touching and beautifully composed, which is more than I can say of myself as I read it the other day. I hope it helped you to write it and to share it. A Homemade Life is one of those books I ordered for the library mainly because I wanted to read it, but then I never got to it. It's still on my TBR list, but guess I need to move it closer to the top. I am a sucker for beautiful pens and journals. I am a writer – not only in the "author" sense of the word, which is still limited to a couple short stories – but in the sense that I love the act of writing. Just putting pen to paper. One of the reasons I like my daughter's name, Amanda, is because it flows beautifully when you write it – lots of loops and swoops. 🙂 I've been a journal writer for years and like you I used to stick to notebooks (usually purchased en masse at the back-to-school sales) but I have discovered that a beautiful journal just adds to the joy. Hope you enjoy all your new finds. You have so many good books going right now. I like the sound of the inner excavation. One thing I vow to do this summer is spend more time "being still" and working on me! I would very much like to read A Homemade Life too!